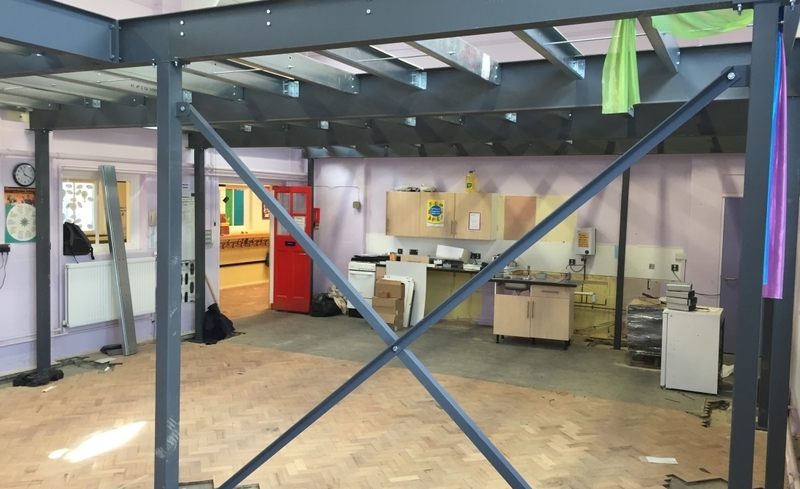 Desperately short of space, the school wanted a mezzanine floor installing to provide canteen and work space for staff on the mezzanine, creating new additional teaching areas below. The design had to complement a traditionally constructed early 20th century building and we had to overcome problems raised by that traditional construction. Of particular concern was floor loading from the mezzanine onto the building floor which was wood block flooring. On an aesthetic note, the school wanted the investment to make a statement and therefore a “wow factor” was needed. We worked closely with Fox Maintenance and the school to develop a design which allowed them to incorporate much of the support structure into partition walls. Some cross bracing was left exposed as a design feature but was placed high up so it did not intrude on valuable floor space. We provided all the load calculations required so that load bearing concrete pads could be installed in the precise locations to support the mezzanine safely. We designed and installed a feature staircase and balustrade using glass and stainless steel. This feature was also used to provide safety balustrade in front of full height original windows. It can be a challenge installing a modern mezzanine design in such a traditionally constructed building. Bradfields understanding of construction techniques and subsequently their close liaison with Fox Maintenance meant that all the potential problems were identified, investigated and solutions planned before the installation commenced. To minimise disruption to the school we programmed the work over an Easter Holiday. This was particularly important as access to the work area was very restricted. Getting all the material into the build area had to be carefully planned and executed to stay on programme. The end result provided new space for teaching and support staff, and created new much needed teaching spaces below. The solution was so well received the Junior School on the same site has ordered an identical solution for their own building!